More than one third of the 175, 000 people attending Glastonbury this year are expected to make the trip to Pilton via public transport. If you plan on doing the same, a wide range of public transport options are available to you from Bristol Airport to the festival. If you’re travelling to the festival site by car instead, there are a number of different routes that you can take. The closest airport to the festival is Bristol International Airport and rather handily, there is a regular bus (the “Bristol International Flyer”) that runs from the airport to Bristol Temple Meads railway station. 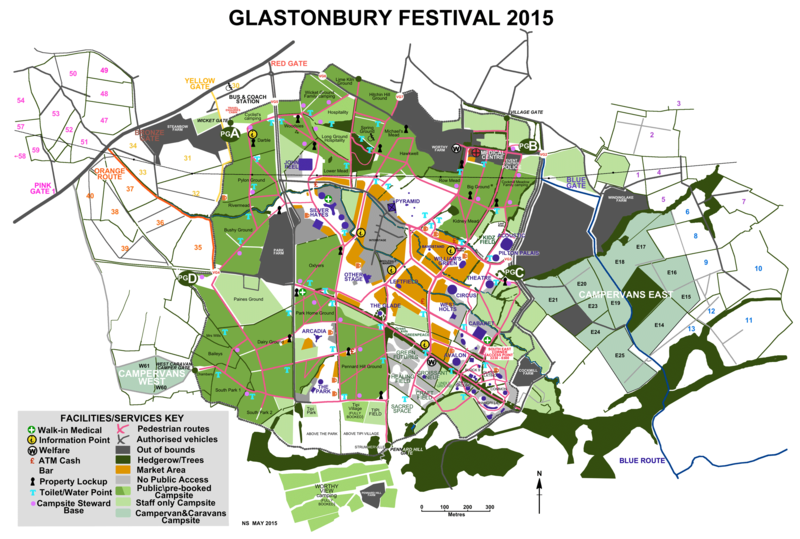 From there, you can then catch one of the frequent buses to the Festival Bus Station on the Glastonbury site. If you’re flying into Heathrow Airport, National Express runs buses directly to the Festival. You have to book return tickets online in advance here. If you’re feeling a bit plush, you can actually get a helicopter to the festival and avoid the horrendous delays that occur every year in the vicinity of the festival. See www.flyglastonbury.com for more. From London, you can get a train from Paddington Station and then go to one of the following train stations closeby: Bristol Temple Meads, Taunton or Castle Cary, with the latter probably being the most convenient, although it will be extremely busy. From Castle Cary, you can catch the free shuttle bus for Festival ticket holders which will be running throughout the Festival. This runs from Wednesday to Monday with no services operating during the night when trains aren’t running. You could also get a taxi from Castle Cary which would cost £30 depending on the time of day. National Express are the official coach travel partner for Glastonbury and run coaches to the event from various starting points across the UK, with the first bus arriving at Worthy Farm at the very early time of 5:30am on the Wednesday. Go here for their website and the timetable is here. The Brighton Peace and Environment Centre (BPEC) are also running an eco-friendly option to and from the Festival drop-off point. You can get a ticket from either London or Brighton for £50 return. See here for more. It’s important to remember that all private hire buses will have to use the Drop and Collect facility on the A371 road close to the festival. From there you will then need to get one of the 24/7 shuttle buses which will drop passengers directly to Pedestrian Gate A (it takes around 15 minutes). If you’re bringing your car to the festival, parking will cost £25 per vehicle. Glastonbury organisers have put together the below list to give a quick overview of the routes you’ll use if you’re driving. If you’re using the satnav coordinates keep in mind that they won’t get you all the way to the festival site but there will be plenty of festival signs so once you see them, follow them. The best chance at avoiding long queues of traffic is to use the Blue Route (approach from the A303, then the A37) as there are more parking spaces and there’s usually less of a queue to get into and out of the site. Organisers also point out that the worst time to arrive by car is between 7am and 2pm on Wednesday. Case in point, in 2010, at peak times, the A39 queue to get into car parks took several hours, while it took less than an hour for those travelling on the A37. It’s always good to print off or download a map of the festival site to your phone. You’ll be thankful for it when you’re trying to find you way to Years and Years’ performance on Saturday (they’re playing the John Peel Stage btw!). Other handy maps are available online here and here. Main Image Credit: Rachel Docherty. Used under CC license.